[dropcap style=”font-size: 60px; color: #9b9b9b;”]H[/dropcap]alloween is just around the corner, and some people will celebrate by watching scary movies about brain-eating zombies. 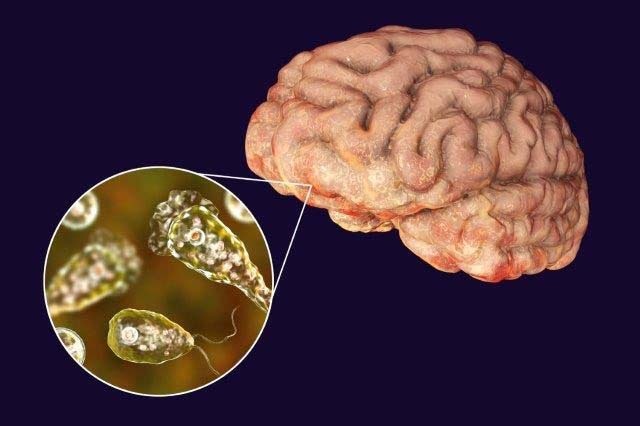 But even more frightening are real-life parasites that feed on the human brain, and they can be harder to kill than their horror-movie counterparts. Now, researchers have developed silver nanoparticles coated with anti-seizure drugs that can kill brain-eating amoebae while sparing human cells. The researchers report their results in ACS Chemical Neuroscience. The team chemically attached the drugs to silver nanoparticles and examined their ability to kill amoebae. They found that each of the three drugs alone could kill N. fowleri and A. castellanii, but they worked much better when bound to silver nanoparticles. The drug-nanoparticle combos protected human cells from the microbes, increasing their survival rate compared with untreated infected human cells. The researchers propose that these repurposed drugs, aided by the nanoparticles, might kill amoebae by binding to protein receptors or ion channels on the single-celled organism’s membrane.